It appears a rainbow party all week-long with the Gay and Lesbian Film Festival on until the 27th of October 2013 at Hyde Park, as well as #jhbpride kicking off with its Pre-Party on Wednesday night at Café Culture in Fourways. Glitter for everyone! Pre–Party on Wednesday, 23 October 2013 at the fabulous Café Culture in Fourways. Between 18h30 and 20h30 snacks and Stoli Cocktails will be served and I am sure the party doesn’t end there! VIP Tickets include Pride VIP parking (I looked at the map, you want this! 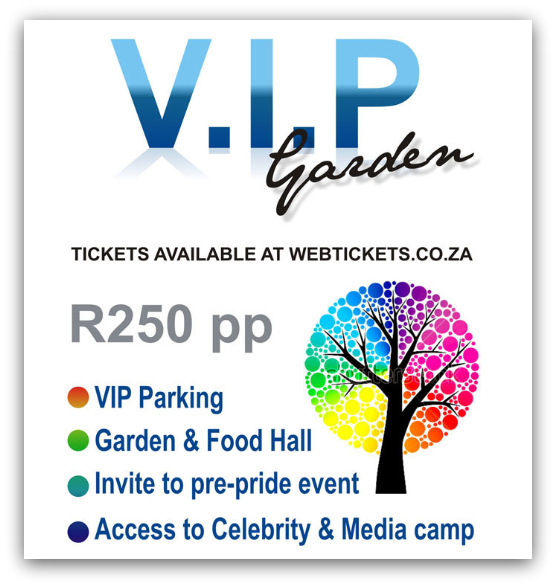 ), access to Pride VIP Garden (right next to the stage), food hall, spirit & shooter bar, MR GSA, Pink Loerie Wine Bar (that just sounds fancy), the media and celebrity hangout…. where I am sure you may find the awesome @Gordon_Grieve… (from Beefcakes – yes, I am shameless…) no secret my money is on him for a MR GSA win! For those not lucky enough to win tickets, they can be purchased from Webtickets (conveniently you can also purchase tickets for the Beauty and Wellbeing Expo at Webtickets – awesome PRODUCT give-aways next week… Yay!). The winner will be selected by a random draw and will be announced on Tuesday afternoon, 22 October at 16h00. Question: Where can you purchase your VIP Pride tickets to show your true colours at #jhbpride? Previous Article Beauty and Wellbeing Expo Ticket giveaway – Who is going? EVERYONE!